Norway’s Progress Party has become the latest to back dual citizenship, thus creating a majority in the current Parliament in favour of allowing Norwegian citizens to have two passports. The party, meeting for its national meeting over the weekend, also voted to ban circumcision, hijabs in public schools and surrogacy, after heated debate. The voting was close and chaotic, so close that recounts had to be made on several issues. The results weren’t always in line with the party leadership’s wishes, either, as in the ban on circumcision of baby boys. “I’m against forbidding it,” Progress Party leader Siv Jensen told newspaper Aftenposten after a particularly chaotic session late Saturday. A last-minute compromise proposal, which would not have banned circumcision but abolish state funding for it, floundered and a majority thus voted against the practice that’s a ritual among most Jews and Muslims. Circumcision has been a controversial issue in Norway for years, but state officials decided to fund it at local hospitals in order to discourage parents from resorting to private unregulated clinics. Norwegian doctors , however, reserve the right to refuse to perform circumcision on the grounds it’s an unnecessary procedure from a medical point of view. Jensen insisted the measure was not directed towards religious minorities in Norway. Faced with defending her party’s majority, she called the measure “a matter or principle” and noted that the Progress Party has consistenly defended Israel over the years. The Progress Party has, meanwhile, assured a majority in Parliament that now favours finally allowing dual citizenship in Norway. The Conservatives, the Christians Democrats, the Liberals, the Socialist Left and Greens parties have all approved dual citizenship earlier, leaving only the Center Party opposed to it. Labour has been unwilling to take a stand, although its youth organization AUF has been firmly in favour. It remains unlikely, however, that the issue will come up for a vote before the September election. That’s because the government hasn’t completed its own formal impact statement on dual citizenship, and Labour won’t decide until it’s been distributed. Acting Immigration Minister Per Sandberg of the Progress Party confirmed that it won’t be ready before the summer holidays, while Parliament won’t reopen until October, and then with a likely a different constellation after the election. “But now I have the party’s advice and position on the issue,” Sandberg told Norwegian Broadcasting (NRK), “and what direction we should take.” The Progress Party’s reasons for backing dual citizenship, however, differ sharply from those of the other parties’. While they claim Norway’s current ban on dual citizenship is old-fashioned in a globalized world, the Progress Party wants asylum seekers and other immigrants to be able to keep their original passports if they become Norwegian citizens, so that it will be easier to strip them of Norwegian citizenship later if they’re found to have violated asylum or immigration regulations. If they only have one passport that’s Norwegian, they’d be left stateless, and that can make it more difficult to deport them. 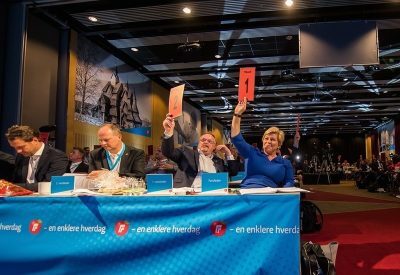 The Progress Party also moved forward with its earlier decision to vote against any prospect of membership in the EU, but the party wants to renegotiate the trade agreement Norway currently has with the EU. The party also voted against a proposal to allow surrogacy in Norway, thus upholding the current ban on it. “I’m against women renting out their wombs,” Immigration Minister Sylvi Listhaug, who just had a baby herself, declared from the podium over the weekend. “In practice, that opens up for the sale and purchase of children by wealthy people.” The Center Party and Kristelig Folkeparti are also opposed to surrogacy, even though many would-be Norwegian parents thus opt to travel to India or the US to obtain children through surrogate mothers.